Coal or solid fuel can be used in any stove referred to a 'multi-fuel'. 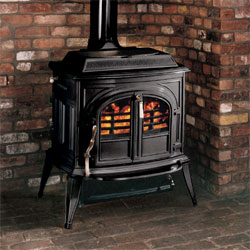 Traditionally stoves were designed for either coal or wood. Coal stoves were too small to burn wood efficiently and wood stoves too big for coal. New multi-fuel stoves use highly efficient designs allowing them to burn coal in a larger stove, which allows them to be big enough to burn wood efficiently. Dedicated woodburning stoves will not have a grate as wood burns better when on a bed of its own ash, solid fuels need a grate to allow air flow from beneath during burning. Coal is of course far more expensive than either wood, however coal still works out cheaper than economy 7 or bottled gas and is easier to store than wood (a small stove would use a single 1 cwt / 45 kg bag each week). Coal is a fossil fuel and does contribute ancient carbon into the atmosphere.